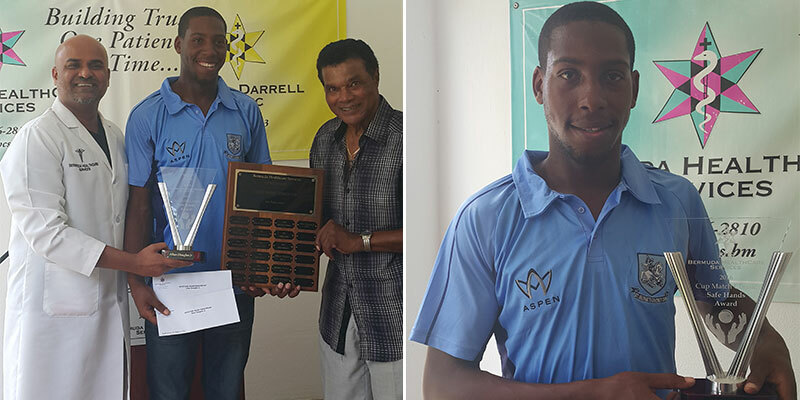 Bermuda HealthCare Services has presented St. George’s player Allan Douglas with the 2016 Safe Hands Award. “Medical Director for BHCS, Dr. Mahesh Reddy presented Mr. Douglas with a $1,000 cash prize, a $1,000 travel voucher and the Calvin “Bummy” Symonds plaque. “The Safe Hands Award was established 1998, with the Calvin “Bummy” Symonds plaque unveiled in 2003 to honour the outstanding cricketer who led St George’s to eight victories between 1961 and 1969. Very very proud of you Allan continue to strive to be the best that you can be and also to keep the spirit of our much beloved Qre alive in Cricket and the Club.